Two quick vases this week. I found this rose lying on the ground. No-one admits to anything so I suppose it was a victim of the weather. I don't know what this rose is but it's a gorgeous copper colour when new then fades to peach. Shown here, just as I found it, with raindrops enhancing it. Should roses ever be photographed without raindrops? There is so much going on in the way of flowers at this time of year that some little things can get lost amongst the crazy dahlias. 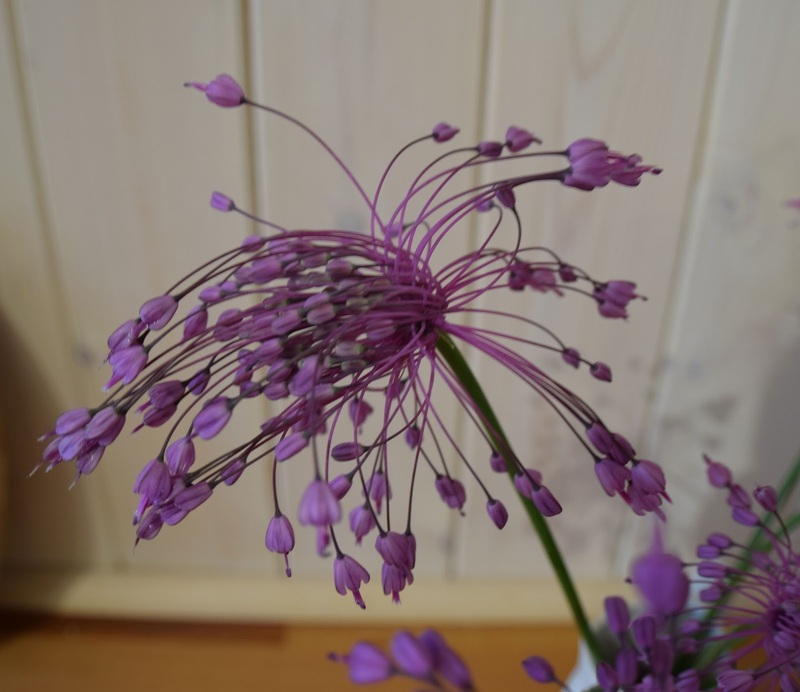 I chose these Allium cernuum ( I think that's what they are, correct me if I'm wrong) so I could enjoy them inside though I do admire them every time I pass outside. Great shadows in the photo too. 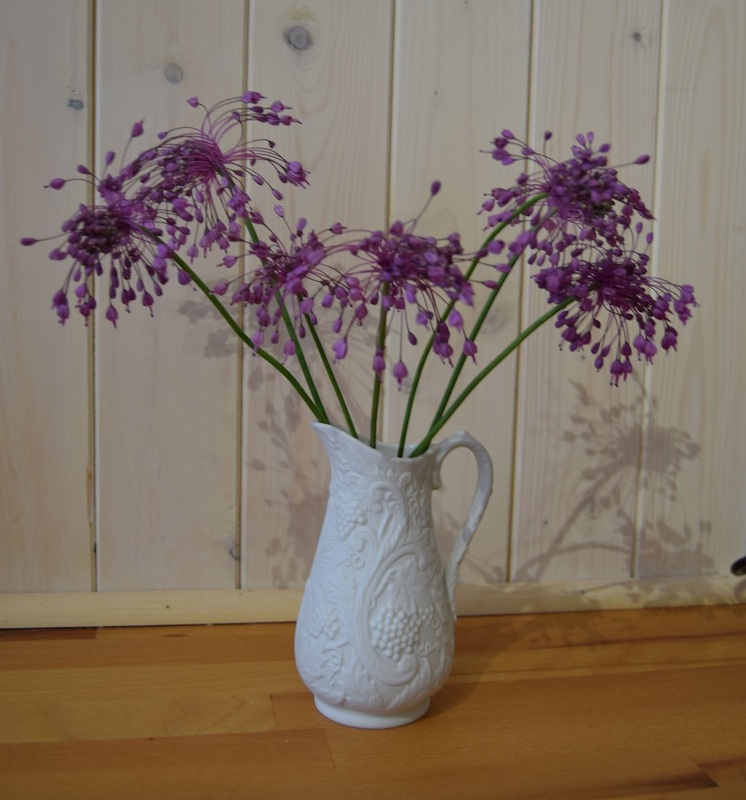 For fancy and fun vases from around the world visit Cathy at Rambling in the Garden - In a vase on Monday. Just a few notes now about my cutting beds. For a number of years I've tried to grow flowers with the aim of having plenty to cut without stripping the borders. This year has been the best ever(2nd full summer here) but there is still room for improvement so hopefully I'll read this next year and take note. From the right front first bed - Sunflowers, Nicandra, Chrysanthemums 1 bud so far, Migon Dahlia for Bee obs, Nicotiana, Birch trees waiting to be moved. Good points - things have flowered brilliantly and I've had loads for myself and to give away. I gave them proper support - for the first time ever. It doesn't look particularly beautiful but I think the eye is drawn to the flowers rather than the ugly mesh. The mesh and post system has really worked. I've deadheaded reasonably often and not had too much trouble from pests. I have plenty of foliage to add but a few more background plants would be useful. The Atriplex looks great flowing over the sides of this slightly raised bed. It has rained very frequently since flowering began in earnest so I have not had to water. In a dry summer (!) much watering would be needed. Fourth bed - This was supposed to be squashes but they are completely swamped by Atriplex. There is one squash growing. Could to better - Even with the amount of space I have I plant things too close together. Several smaller more delicate dahlias are swamped by the bullies. I didn't take note of how tall the new ones would be so they are in the wrong place and struggling. There are probably too many cosmos all crammed in. They are still producing lots of leaves but plenty of flowers now too. I sowed Ammi in the autumn and it did very well but went over quickly. 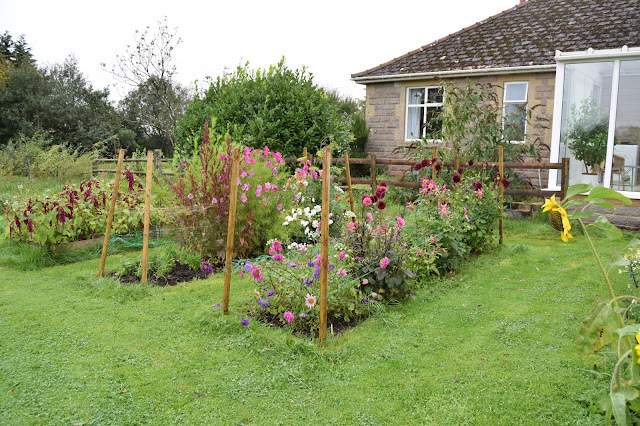 A few sown in autumn and a few in spring would be better use of space and last longer. I don't need 20 plant of the same thing. Some more subtle flowers would be good as a foil the brightest and biggest. Sweet peas have been dismal. I should grow them round here next year. I've missed Rudbekia Rustic Dwarfs as they either didn't germinate or didn't survive. Buy new seed! From the other direction - Dahlia Labyrinth swamping Bishop of Oxford and Gallery Art Fair, Cosmos and one dill plant. What has done well for you this year? Or what will you do better next year? 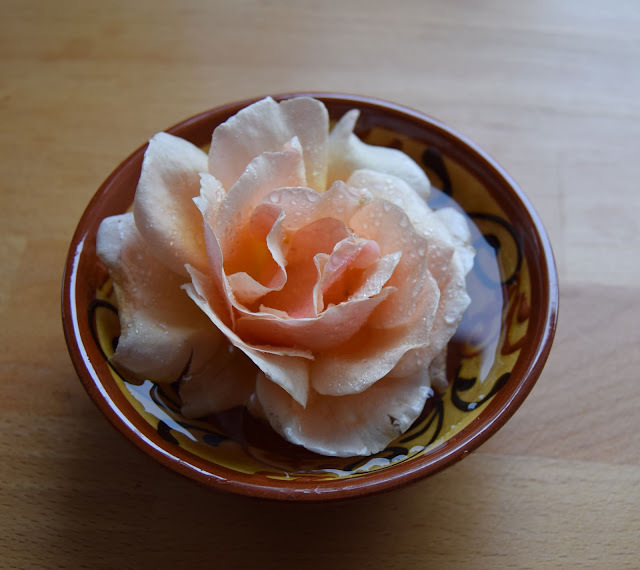 Love the way we gardeners can cherish a broken blossom....And admire dew and raindrops. I have been mentally making notes...what a good idea to list them too. Let's hope I remember to look at my list. I am interested to see alliums flowering so late...the close up detail is delightful. 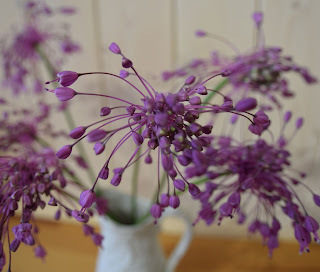 The rose is gorgeous but I fell head-over-heels for those Alliums. Alliums in general don't do well here but I'm determined to try growing some (again). Thanks for sharing your experiences, good and bad, with your cutting garden too. This is the first year I've had one, having given the raised planters in what was my vegetable garden over to flowers this year. I did too little too late on supporting the stems so everything is flopping all over the place but I'm going to try netting and other supports, especially for the heavier than expected dahlias, next year. I've never done proper supports before and still have other things elsewhere trailing or falling over. I put in some feeble sticks for some plants and they blew over. Still, little by little. The Alliums are lovely Alison... I have also been noticing shadows recently, and this one is very effective! Thank you, it wasn't planned, I just noticed as I took the picture. Your rose is almst the same colour as my dahlia today, and those allium are gorgeous!! Do they grow OK for you, and come bac each year? I must check the Peter Nyssen catalogue nd see if they have them although it is probably too late to add to my order for this year. 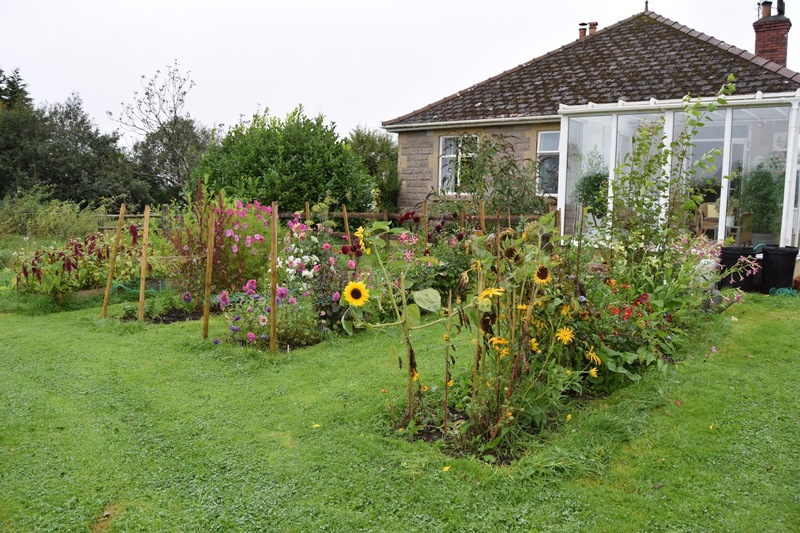 Great to see your cutting beds and to read your feedback - each year I learn more from mine, particularly which plants to partner up. My zinnias are being swamped by cosmos this year! They have been there at least since last year. They came from my mother and I confess I wondered what they were when they came up again this year. I'd be happy to post a few bulbs to you. The rose is beautifully presented. Raindrops do add that extra something. Love the Alliums too. Your rose looks fresh with its raindrops and I love the look of the purple allium. I expect it would keep well in a vase, most alliums do with changes in water and fresh snips. 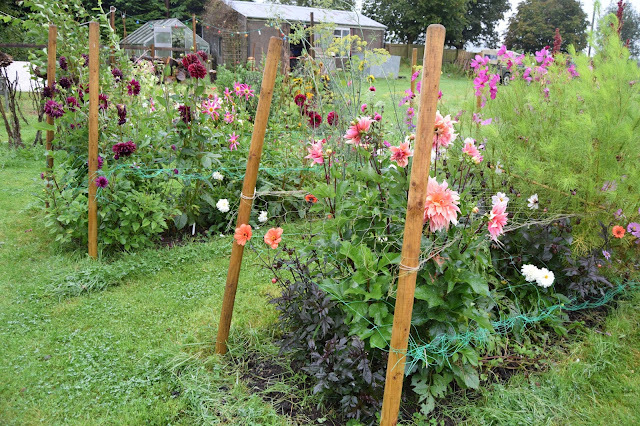 You must have lots of flowers to arrange with that fine cutting garden! I am very lucky and have more flowers than I have room for. I finally have the cutting garden i have dreamed of. I mean have room for inside. Ah I do like your allium. They are a lovely shape and their shadows double the effect. I've been taking lots of flower portraits this week, because they've looked so pretty with raindrops adorning them. It does make most things pretty but others look sad and bedraggled.